Joining Ginny again for Yarn Along this week, and my knitting for this week is a blanket that I've been slowly working on for several weeks now. I'm about 80% done now and ready to be finished! The yarn is Knit Picks Simply Cotton, a relatively inexpensive organic cotton yarn, in both Prussian Heather and Basalt Heather. I chose to do a basket weave pattern of 10 knit/10 purl for 10 rows, then reverse the stitching for the next 10 rows then switch colors and repeat. I think this will make a nice lightweight blanket for the end of Philip's bed, and likely to be a birthday present. The book I've been reading the most over the last week is probably Ice Pop Joy, a birthday present from Paul, and oh, have we been enjoying this book! 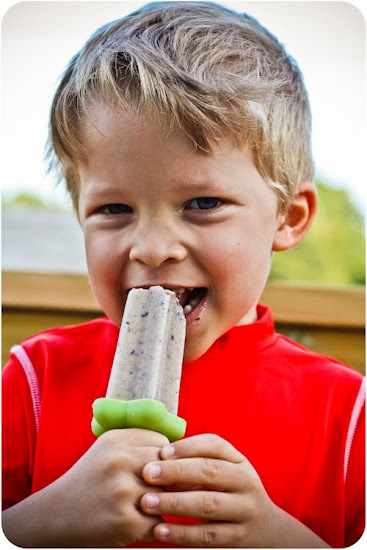 We started out trying the Blackberry Swirl recipe, which was quite delicious, but I got no photos of those pops because the kids were so eager to eat them that they didn't wait until the popsicles were fully frozen thus requiring them to spoon the slushy pops from the mold. The second recipe we tried was Peach Party, the fan favorite so far. I've even overheard the kids talking about them at random times, "remember the Peach Party, now those were some tasty popsicles!" We also tried the Breakfast Pops, which were a 50/50 score. I subbed blueberries for the walnuts since my kids aren't crazy about nuts in their food. I thought they were pretty good, and they definitely got eaten so I'm sure we'll make them again. 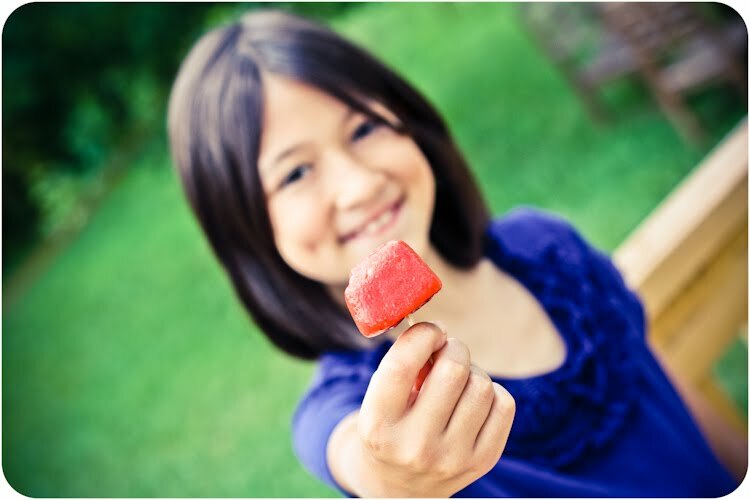 I think the second most popular pop we tried was the Peace Pop. Laden with carrots and strawberries, these were quite delicious, and despite the kids opinions, I think I like them better than Peach Party. Next on our list to try are the Citrus Cooler and the Classic Vanilla Tofu. 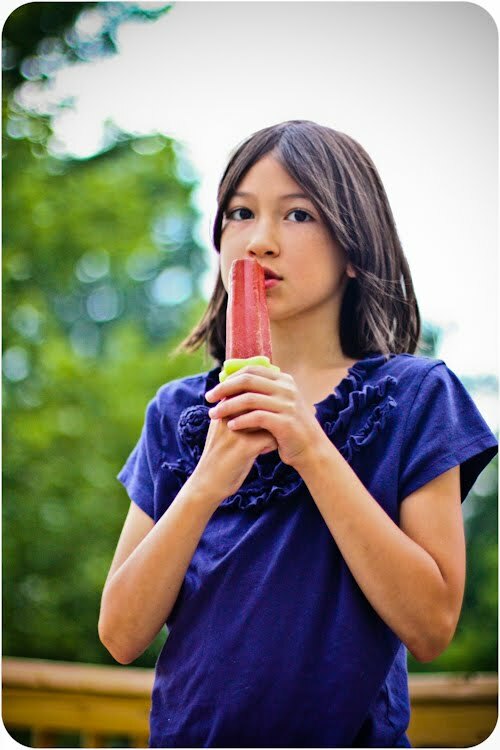 Elizabeth is suspicious about the tofu, but since her favorite popsicle as a toddler was cocoa powder, tofu, almond milk and honey, I think she'll be fine. We even discovered that our overflow ingredients could go into an ice cube tray with some toothpicks for snack-sized pops. Liquid sunshine on a stick! 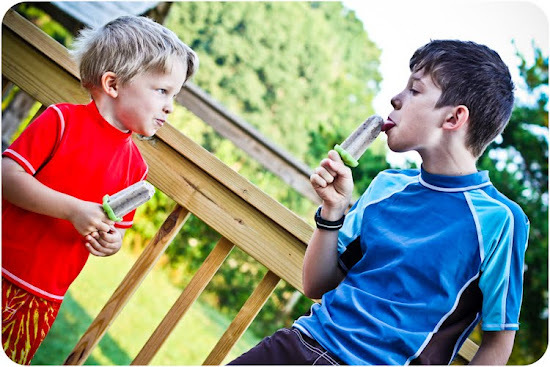 Those Popsicles look delicious! 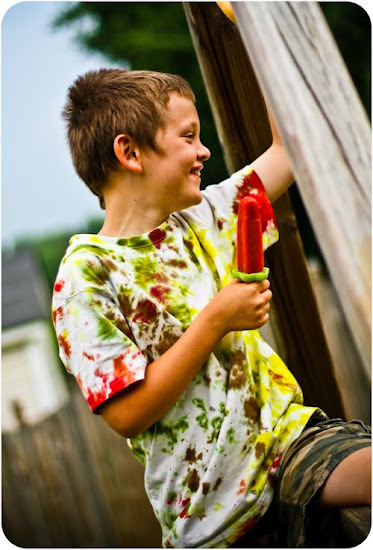 I think I'm going to have to steal this idea, my boys would get so excited about making their own popsicles. wishing i could reach through the screen... mmmmmm. We have been making mango lassi pops which zach is crazy about (basically small yellow magoes and lassi yogurt or any yogurt). i bet your tribe would like them. 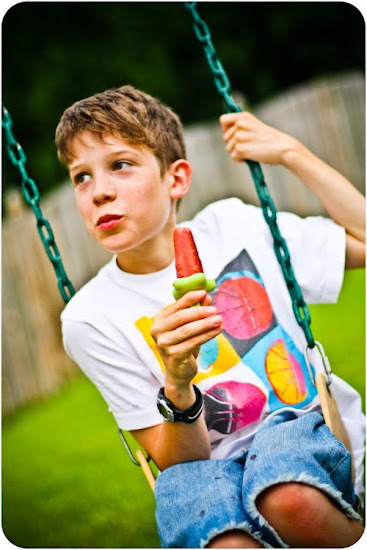 We love fruit pops! Do those recipes have an added sugar? 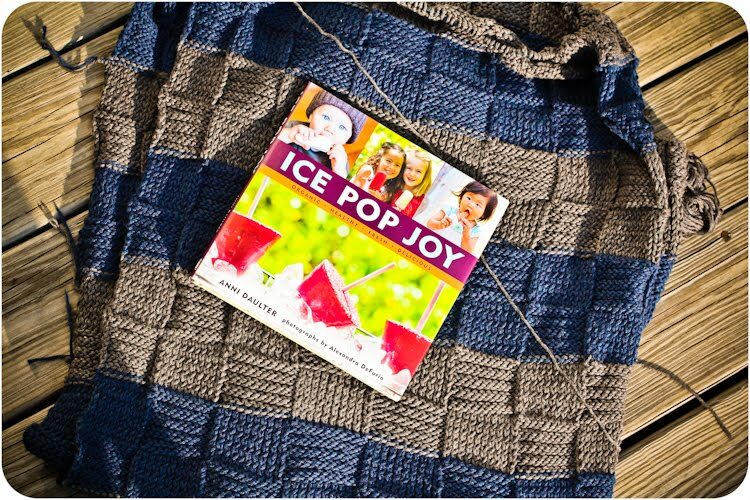 I love the blanket you are knitting Joy, I think I might just have to try and make one myself:) Thanks for sharing the book title, it does look amazing. The blanket is gorgeous! I love basketweave stitch and the two colors are perfect together. 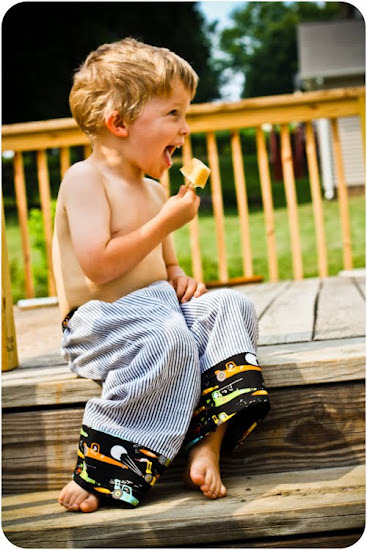 One of your icepops would be lovely here since it is HOT! 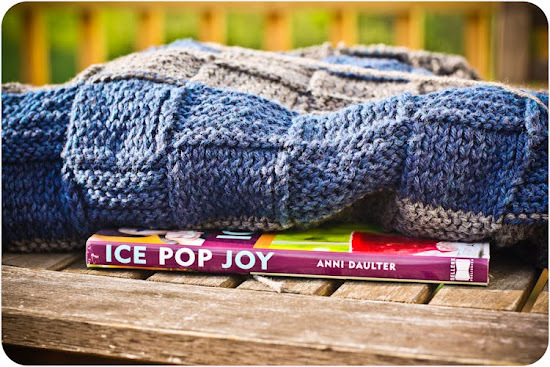 Lovely blankie, and the icepops book sounds amazing! I love those pop pictures! We recently got that book but so far I've only used it as inspiration to come up with our own random flavour but I must try following a recipe. Yum! The blanket is lovely - I love the grey and blue together. I keep seeing this book pop up everywhere, perhaps that means I need to make popsicles! Yum! 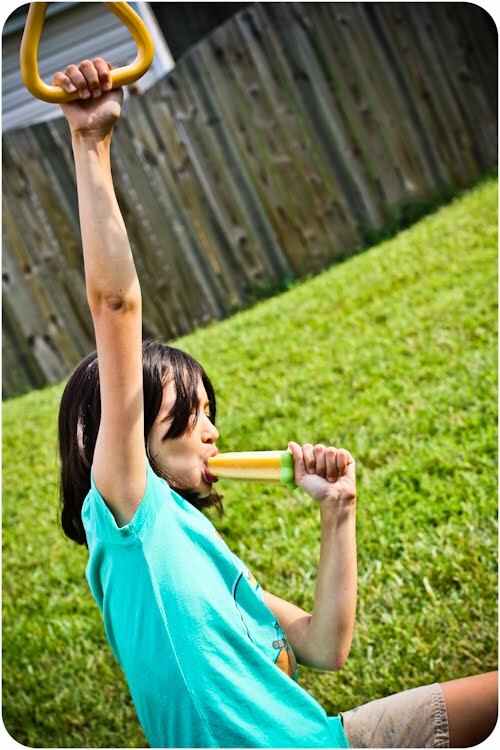 I just got those Popsicle molds! I hope they always work well. I need to get that book. Popsicles are just fun! Lovely blanket, and thank you for that book recommendation! We've been making our own too, but they've been pretty generic combos. Wow, all of those sound great! Nice that they are healthy, too. Great pictures! They're like popsicle commercials. 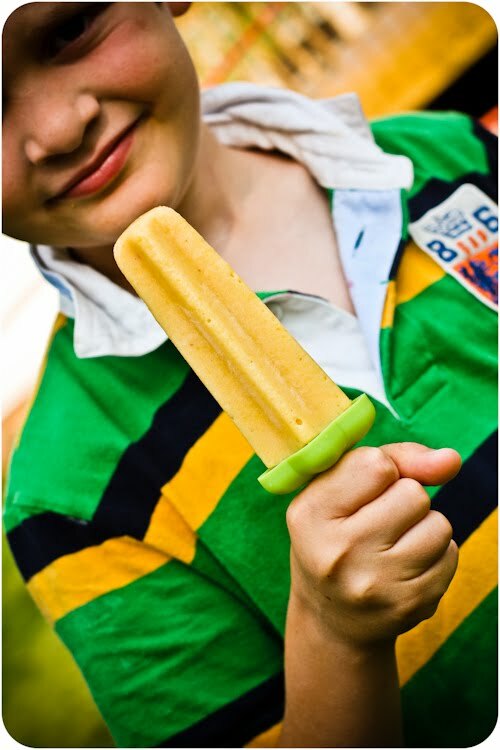 =) My question is: where do you find bpa free molds? Wow! all those pops look delicious. We made peach pie pop just the other day and they were a huge hit. I may have to see if i can find ice pop joy. YOur blanket looks lovely. I really like the pattern and colors. Oh that blanket is cool-love the colors! The pops look delicious. Your children are absolutely gorgeous! 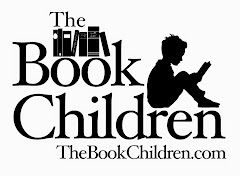 I have been looking at the book for a year now! lol. I should just get it already, lol.